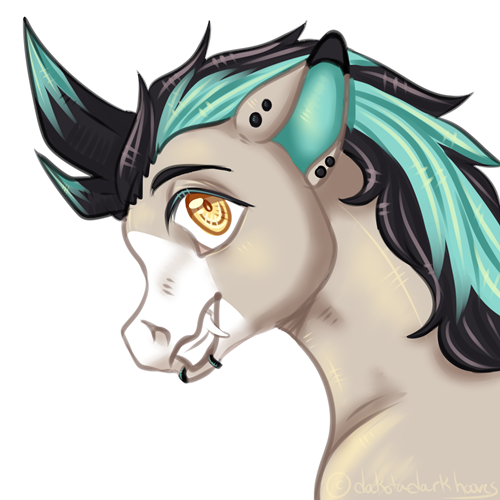 A piece of one of my characters. He is a closed species from deviantART, a Space Cotton Mouth. 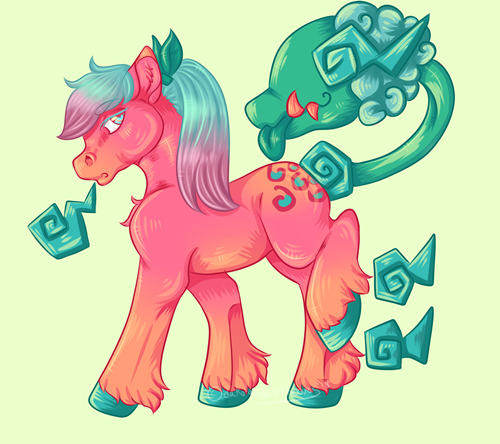 A character design/piece I sold on deviantART, named Starkissed Satin. 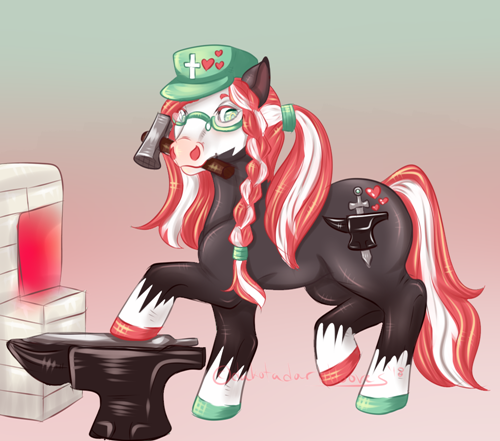 Firstly, a colored digital piece of my ponysona, Merry Anvil. 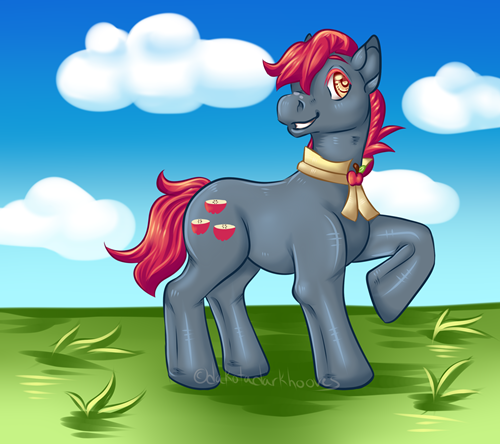 This is a slightly older digital piece but here is one of my pony OCs, Nightlore. 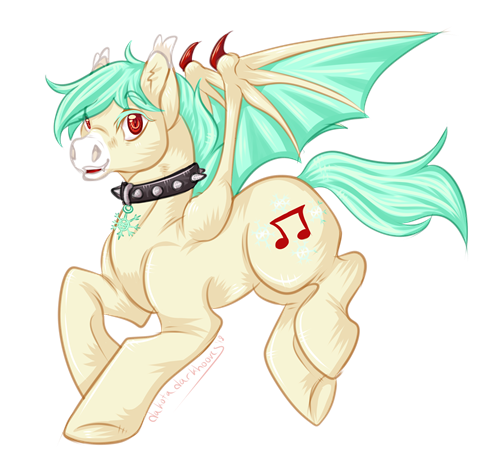 He's a vampire pony who enjoys reading history books and researching folklore. 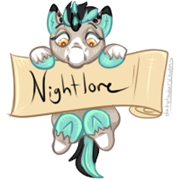 What is the story behind Nightlore? What a great name. Just character-wise, I've always been a fan of vampires. 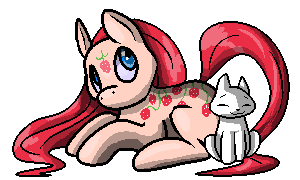 So combining two of my loves was gonna happen at some point haha. 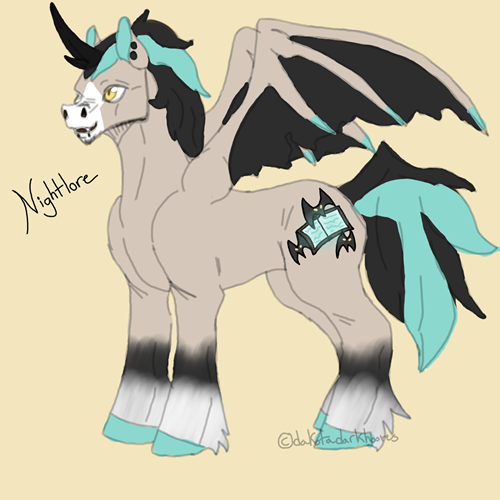 Nightlore was just a random pony design I doodled one day and I decided to turn him into a character! Nightlore has a somewhat...bad and dangerous hobby of researching dark magic, on top of his seemingly harmless love for folklore. He came across an old tome that had been chained up and magically sealed (gee 'lore, maybe there was a reason for that), and his curiousity got the better of him. He ended up becoming cursed with a form of vampirism. It's not technically true vampirism since it was more of a curse than the actual disease, but it does come with some similar side-affects. Obviously fangs and the thirst for blood, but he also has sun sensitivity (nothing too bad; it makes him sneeze if he's out in direct sunlight for too long). He can also sprout bat-like wings for a short period of time, but since it's sort of a spell it takes up large amounts of magical energy to keep it up and he can easily become exhausted if he utilizes them for too long. 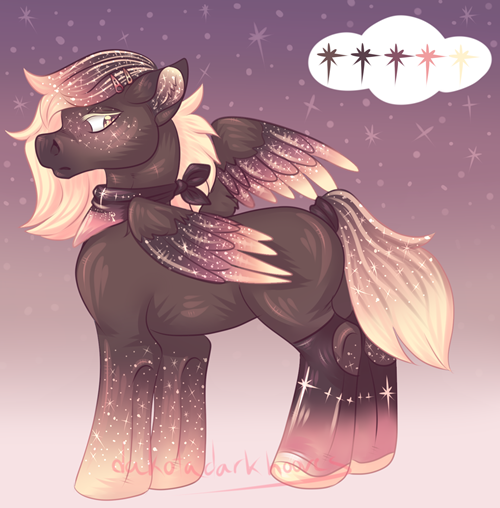 On top of that, the curse disfigured his horn and changed his cutie mark to depict bats swarming the lore book, instead of the stars he'd had before. He's actually a folklore fanboy though so the whole situation is definitely not a bad thing in his mind. He's currently taking...I guess you could say vampire lessons?...from an alchemist friend who's a more traditional vampire (got the bite from his sire, literally can't go out in the daytime, etc.). Wonderful and well detailed designs! That one reminds me of Audrey II. 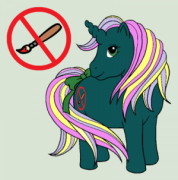 Your art is really great, and your pony designs are so unique-looking. I especially love the Starkissed Satin piece. Oh I just love your art! And you use such lovely, lively colouring. It's all just beautiful! Of course! I hope you'll post more art soon. Absolutely! I have a few requests I'm working on now, and I also started a series of traditional colored pencil drawings that I'll likely scan and post soon. Oh my gosh you’re right! Little Shop is one of my favorite musicals! These??? Are so amazing?? I love this so much! Ahhh oh my goodness, thank you so much! >u< I really appreciate that! Wow! I love your artwork! Thanks for sharing this!! Hope to see more of your artwork soon.